Vintage Mustang Forums > General Discussion > General Discussion (Non-Vintage Mustang) > You ever just sit back and think, "Man, I have it good"? You ever just sit back and think, "Man, I have it good"? The Lone Star Roundup is happening this weekend - biggest hot rod show in Austin and one of the biggest in Texas, IIRC. It is unique in that you can't enter any car younger than a '63 - which means all the muscle car era cars are out! But they can't stop you from cruising with them down on South Congress, or from hanging out at Top Notch for a burger and hot rods. Well, I haven't started Jane since sometime in November. No joke. I had her down for a steering swap, then I was gone for a month, then I was lazy for a month, and... well, here we are. I wanted to give stainless steel trim repair a try and that took up a huge chunk of time and so I found myself today going, "Huh, I should slap my car together and take her to Top Notch to hot rod around". So I slapped her back together (pretty sure only the lug nuts are tight...), cleaned up the paint a bit (5 mins with the Chadwicks), and cranked her up (started first try) and off we went! No fuss, only the minimal expected grumpiness, just a nice perfect cruise down to hang out. So I'm sitting here with all these hot rods looking at my own thinking that I could not be luckier. I have somehow, against all odds, managed to build and hold onto a car that can do this. We drive all weather, rain or shine, 6-8 months of the year. During that time she runs hard over any terrain, at any speed, at any distance from home, with nary a hiccup. Then I take her all apart and futz around for 4-6 months, not bothering to do any of the standard "car wintering" things (tires off the ground, fuel stabilizer, fluids, whatever) and generally neglecting her. Then I slap her back together haphazardly when I find something interesting to do, and she is ready to go right out of the gate, without fail. Even when I run into an issue this car still runs. So yeah, I've got it good. Life is good when you have the right car. 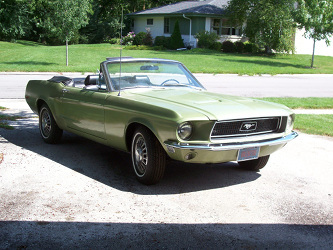 Russstang, gwstang, c6fastback and 19 others like this. I love your attitude. I have had kinda the same feeling a lot lately. I'm in my 40s, have a decent job, a great wife, and a kid that still likes me. I have a decent home, and enough left in the bank account at the end of the month to have a toy car. I've been working my *** off for more than 20 years now, and it's finally starting to pay off. Life is pretty good right now. I feel partially lucky, but at the same time it's nice to step back and see the fruits of all the hard work. And for those of you that aren't there yet, keep trying. I hope your day comes too, and comes soon. And just to make it clear, I would not be where I'm at without the help and support of my wife. She makes me want to be better at life. Boss5Oh and myfirstcar66 like this. I keep noticing the DOT puts up signs to honor my burnouts. That's nice of them. Very nice story, you live life to the fullest and thanks for sharing. Also must be nice to attend a car show that's not full of new cars. Understand why you’re living, and who kept you alive and every single day is an Awesome day. It’s one more day that you have that maybe you shouldn’t have to even be around to complain,....if you so choose. gwstang, rpm, awhtx and 1 others like this. Sounds like you're livin' the dream! Keep us project-goers in mind and appreciate it for us! Can't wait to get my car to the point yours is at and be able to cruise with ya'll. Rust-bucket 1969 Mustang Mach 1. Build thread link! I don’t know how I missed you! I’m back at the Roundup for the first time in too many years. Was at Top Notch for a few hours yesterday evening. But to your larger point, yes, I know that feeling. All good. But, the person with one nice car starts thinking, another would be better. Then the person with two nice cars starts thinking, another would be better. And on and on. You might start thinking that the next garage will be bigger. And it ought to be. gwstang and myfirstcar66 like this. Yes and I wonder why! My '64 1/2 vert. Ordered May '64. D code 4 speed, handling package, caspian blue, accent group, Ford blue manual top. '68 vert. driver. Owned since Apr '78. C code AT, AC, PS, P disc B, PT lime gold, standard black interior and top. NOS RF fender and left quarter.New top and folding glass. I get that "life is good feeling" with my car when I'm cruising at 70 mph, 4th gear, driver side window down, left arm hanging out the window, and I'm holding the car onto the road with just my index finger. The sound of the exhaust and the satisfaction that I'm the person responsible for getting to this point is definitely life is good. GearHeadPeter, rpm, 68Hildago and 2 others like this. Yes life is great and a blessing! My ride too has been sitting dormant for the last month or two Dallas. Now I just need to toughen up and put it back together. Thanks for the encouragement, I too am looking forward to firing it up and going for a cruise! Yep, I'm thankful everyday. Since I work in real estate finance, I got hit hard in the recession so things were tight for more than a few years. I stuck it out and am thankful to be on top, have a good home, and a few toys. God is good. awhtx and myfirstcar66 like this. Too soon for any shows round these parts, but I did get mine fired up Friday and drove it to my restorer for a couple things before show season hits. And yeah, even tho it was 35 degrees outside, it felt pretty darn good to get it out and on the roads again. that does feel pretty lucky.